Like all members of the cat family, lynxes are predators and will defend their territory when necessary with tooth and claw. 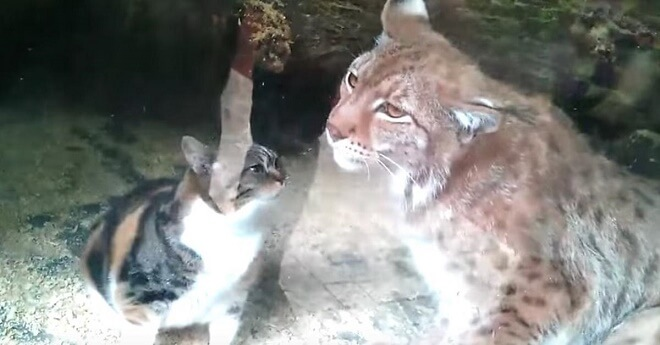 This lynx at the zoo in St. Petersburg, Russia, was confronted with a very unusual intruder one day: a stray cat had wandered into his enclosure. The encounter between the small and large cats promised suspense, but it took a completely unexpected turn. Instead of a bitter showdown between lynx and cat, these friendly felines approached each other with curiosity and affection. Within a few moments the supposed loner animals became the best of friends, devotedly taking care of each other and hardly willing to part ways. In fact, watching them might make you think a friend to curl up with was exactly what both of these sweet guys needed. Not wanting to disturb the warm relationship, zoo personnel decided to let the snuggle-tigers stay housemates. Looks like this match was meant to be!